A recent article “RG-bargy” in The Economist focuses on an argument surrounding the central tenet in Thomas Piketty’s economics bestseller, Capital in the Twenty-First Century. Piketty maintains that a key reason why wealth inequality has worsened dramatically in recent decades is that the return on capital r has exceeded the growth rate of the economy g. As capital is concentrated in the hands of the wealthy, a long period in which there is a growing gap between the return to capital and growth (i.e., r > g) must lead to widening wealth inequality. Citing evidence from eight high-income economies—the United States, Japan, Germany, France, Britain, Italy, Canada and Australia—Piketty shows that, since 1970, long-run growth has slowed but the return on capital has not changed significantly. Thus, in developed economies and throughout the world, wealth has become increasingly concentrated in the hands of the rich. What is more, Piketty predicts that future growth rates are likely to slow down further. Thus, in the coming decades the gap between r and g will widen, and thus wealth inequality will increase. However, as pointed out by The Economist, Piketty’s evidence concerning r > g has been challenged in a forthcoming article in the Cato Journal by Robert Arnott, William Bernstein and Lillian Wu. The authors do not dispute the slow-down in long run growth g. Instead, they maintain that the future return r to capital, principally bonds, stocks, equities and other financial wealth, will also fall. This is due to two principal reasons. First, because yields in the developed world are so low, the future returns from bonds are likely to be reduced. Similarly, sustained periods of low interest rates—such as the current situation—are also associated with reduced equity returns over the long term. Second, Arnott and colleagues argue that the net capital return to investors is even lower, once one accounts for taxes, fund-management costs, and other investment expenses. If based on the net return to capital, the future level of r will decline further. However, this “RG-bargy” controversy has a major shortcoming, which is that it ignores an important source of economic wealth—natural capital. In an Open Democracy article I argued that there would be no agreement between the Greek government and the Troika. I took this position because it was (and is) obvious that the most powerful actor within the Troika, the German government, would not agree to any substantial alteration of the austerity program imposed on previous Greek governments. As a result, Greece’s Syriza government would have no choice but to abandon the eurozone and introduce a national currency. I was correct in my assessment of the inflexibility of the German government and its clients in the eurozone (e.g., Baltic countries and Finland) and the broader European Union (most obviously Poland). However, due to naivety and/or the triumph of hope over experience, I never entertained the possibility that the Syriza government would capitulate to the Troika. The capitulation arrived all the more unanticipated because the Syriza government acceded to EU demands more draconian and more of an affront to national sovereignty than those rejected by 61% of voters in the referendum on 5 July. This is the conclusion of a two-part series on air pollution in Delhi. Part 1, on inequality in exposure—on environmental injustice—is available here. Public awareness of air pollution in Delhi lags behind that in China, where face masks are a common sight and the remarkable film “Under the Dome” received 100 million views within 48 hours when it was posted in March (before being banned by Chinese authorities). But this may be starting to change. This spring, the Indian Express, one of the country’s leading newspapers, ran a searching multi-part investigative series on Delhi’s air pollution called “Death by Breath.” The Centre for Science and Environment, which successfully campaigned a decade ago for conversion of Delhi’s buses and auto-rickshaws to compressed natural gas, continues to raise public consciousness and advocate for policy remedies. Gerald Epstein and Juan Antonio Montecino, Banking From Financial Crisis to Dodd-Frank: Five Years On, How Much Has Changed? Harry Konstantinidis is an assistant professor of economics at the University of Massachusetts-Boston. Most readers already probably know the sequence of events around Greece and its creditors over the last month, but they are worth reviewing: a fruitless and frustrating negotiation leading to a take-it-or-leave-it offer from the creditors; the announcement of a referendum (the first in more than 40 years) for the people of Greece to decide whether to accept the offer; a triumph of the No vote with 61.3% rejecting the offer, despite a visceral campaign in favor of the Yes vote by the Greek media and foreign politicians; the resignation of Finance Minister Yanis Varoufakis; a retreat by Syriza offering austerity for a deal; the creditors’ outrageous demand in a rather open attempt to push Greece or Syriza towards exit; and finally a roadmap towards a deal that no party really believes in. The terms of the agreement reflect the creditors’ attempt to make Syriza renege on all its promises and cross all its “red lines,” except for euro membership. Sharp value-added tax (VAT) increases, the establishment of a privatization fund including 50 billion euros worth of assets, no restoration of collective bargaining rights or minimum wages, automatic cuts when fiscal targets are not achieved, vetting of all legislation by the Troika (European Commission, European Central Bank, and IMF), and the depoliticization of Greek public administration. The deal passed the Greek parliament without the support of almost one-fourth of Syriza MPs, rendering Syriza effectively a minority government and prompting a cabinet reshuffle. How could Syriza have agreed to such a deal? Wouldn’t Greece be better off introducing its own currency, rather than conceding both fiscal and monetary policy? This is part 1 of a two-part series from UMass-Amherst professor of economics and regular Triple Crisis contributor James K. Boyce. This part focuses on disparate exposure to air pollution in Dehli. Part 2, to be posted next week, focuses on solutions to the problem. Arriving in Delhi in January, at the height of the winter pollution season, you notice the air as soon as you step off the plane. A pungent smell with hints of burning rubber and diesel fumes assaults the nose and stings the eyes. On the highway into the city center, a digital screen shining through the smog displays the current level for suspended particulate matter. You don’t need to understand what the number means to know it’s bad. 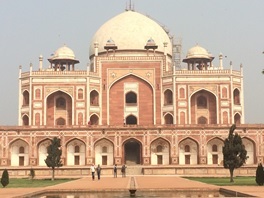 Delhi has extensive parks, broad avenues, beautiful buildings (like the tomb of Mughal emperor Humayan, shown below), and a vibrant culture. But casting a pall – quite literally – over it all is the worst air pollution of any major city in the world. There is a stereotypical image of an abusive husband, who batters his wife and then beats her even more mercilessly if she dares to protest. It is self-evident that such violent behaviour reflects a failed relationship, one that is unlikely to be resolved through superficial bandaging of wounds. And it is usually stomach-churningly hard to watch such bullies in action, or even read about them. Much of the world has been watching the negotiations in Europe over the fate of Greece in the eurozone with the same sickening sense of horror and disbelief, as leaders of Germany and some other countries behave in similar fashion. What’s Wrong with Inflation Targeting? In its strict form, “inflation targeting” posits that central banks should have only one objective—low and stable inflation—and should utilize only one policy instrument—usually a short-term interest rate. As a corollary, the conventional wisdom usually promotes the idea that central banks should be “independent” of the government, in order to enhance their ability to reach the inflation target. This is usually justified on the basis of avoiding time inconsistency and resisting pressures from governments to finance fiscal deficits. No matter how much policy makers such as Olivier Blanchard question inflation targeting in the rich countries, as they have in recent years, it is still widely seen as the current “best practice” for developing countries. Even if one believes that this general approach is a good one, a key question arises: what is the appropriate inflation rate? The standard practice is that countries should try to maintain inflation in the low single digits (Anwar and Islam, 2011). Where does this number come from? One might expect that a number designed to guide the making of monetary policy in many parts of the globe would come from rigorous research and a broad consensus that the optimal rate of inflation for developing countries is in the low single digits. However, nothing could be further from the truth. We seem to be entering a new age of megaprojects, as countries, in particular those of the G-20, mobilize the private sector to invest heavily in multi-million (if not multi-billion or multi-trillion) dollar infrastructure initiatives, such as pipelines, dams, water and electricity systems, and road networks. Already, spending on megaprojects amounts to some $6-9 trillion a year, roughly 8% of global GDP, making this the “biggest investment boom in human history.” And geopolitics, the pursuit of economic growth, the quest for new markets, and the search for natural resources is driving even more funding into large-scale infrastructure projects. On the cusp of this potentially unprecedented explosion in such projects, world leaders and lenders appear relatively oblivious to the costly lessons of the past. To be sure, investments in infrastructure can serve real needs, helping meet an expected surge in the demand for food, water, and energy. But, unless the explosion in megaprojects is carefully redirected and managed, the effort is likely to be counterproductive and unsustainable. Without democratic controls, investors may privatize gains and socialize losses, while locking in carbon-intensive and other environmentally and socially damaging approaches.